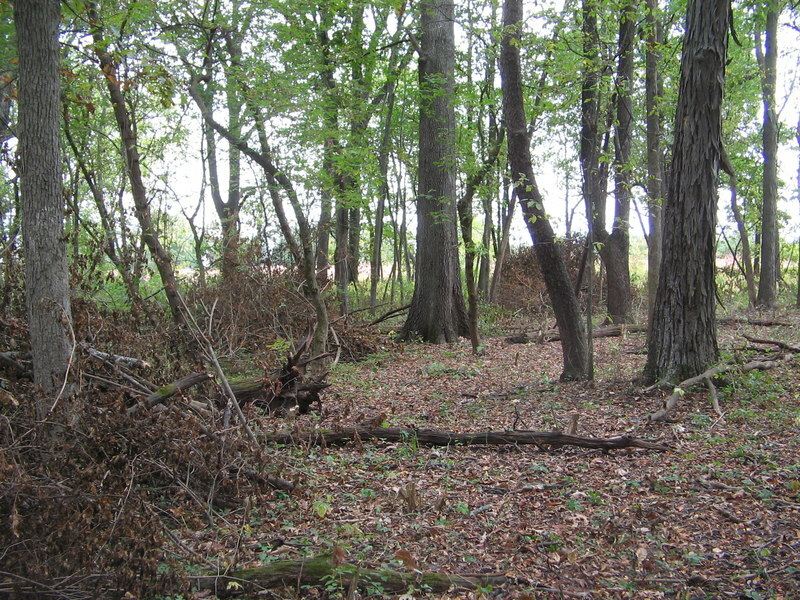 Piles of brush (honeysuckle: Lonicera maackii) accumulate where the forest floor is opened to receive sunlight. One of the finest ways of nurturing a sense of place, developing a direct connection to the land, is the practice of ecological restoration. As stewards—caretakers—we manage the vegetation of the site, which fosters a certain intimacy with the environment. Working the land for the purpose of healing, of restoring the vibrancy of the living systems at hand, connects us to the spirit of the specific locality. And yet, ecological restoration is a fairly recent phenomenon, a current expression of the conservation movement. The conservation of natural areas has taken on different forms over the past century. From early efforts toward preservation of scenic beauties, to the calculated extraction of utilitarian resources, to active efforts to restore natural processes in historical landscapes, conservation has proven to be a multifaceted endeavor. Where once the preservationist presumed it to be sufficient to protect an area from development or despoilment, today’s restorationist seeks to manage natural areas for native biodiversity and ecosystem services. Why the shift? Like many movements, restoration arose as a collective response to perceived threats. Planners, practitioners, and researchers alike recognize that natural areas, left unmanaged, quickly degrade in the face of stressors such as invasive species, altered hydrology, and fire suppression. Natural functions are diminished; ecological relationships are strained; species are lost. Due to the many challenges that stress the systems that sustain them, natural areas require our intervention. To allow nature to take its course no longer serves to preserve the historical character of our native natural communities. So we intervene, we intercede on behalf of native species and the ecosystems in which they live. We remove invasive species, restore habitat, and enhance the diversity of native species present in the system. Such work may feed the human spirit, even while enriching the natural area being restored. Many people find quiet joy and great satisfaction in participating in restoration workdays. Good exercise in fresh air, coupled with the knowledge that we are making a positive difference in the world, combine to bring about a legitimate sense of well being. If you have not yet experienced a restoration workday—or if you have and you are ready for another taste—I encourage you to join us here at Severson Dells to help restore our natural communities. We gather twice a month, on the second Saturday and the fourth Monday, 9:00 a.m. to 12:00 noon, with our inaugural workday slated for Monday, October 23, 2017. Respond via e-mail (gregr@seversondells.org) or phone (815-335-2915) to let me know to expect you. Dress for the weather and be prepared to get dirty. Bring a water bottle and work gloves if you can. And perhaps bring a willingness to be open to that natural connection to the living landscape.